As all petrolheads know, God rested on the seventh day because Top Gear was on. As motoring disciples we must do the same. So when I sat down in my comfy church/sofa last night, to hear my weekly sermon from Pope Clarkson, Reverend May and Altar Boy Richard Hammond, I was slightly put off by the big mans latest addition to the ‘Cool Wall’. Jezza insisted on putting the new Volvo V70 in the ‘Sub Zero’ section of the board. Is it just me or isn’t this the one of the biggest travesties in automotive history? Normally I tend to agree with Clarkson’s decisions but this one just doesn’t work for me. 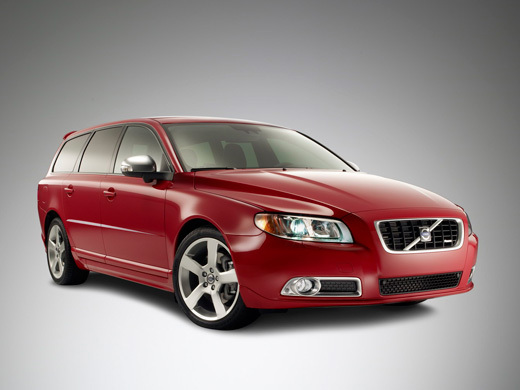 I really like the newly deigned Volvo’s – especially the C30, but the V70 is still a bit of a middle aged/grandad to me. The V70 lacks the spectacle and beauty that is required to play with the big boys such as the Aston Martin DB9 and V8 Vantage. Most importantly the Volvo would fail the acclaimed Kristin Scott Thomas test. If you pulled up to take Kristin for dinner in the V70, she would wonder if you wanted her to help move your knackered fridge to The Tip. Well that’s my weekly rant over. Tell me what you think in the comments below. Top Gear and Clarkson DVD Giveaway! Howard . December 2, 2008 . This Volvo V70 is definitely Super Cool, I use one everyday amd get admiring glances from people at bus stops and especially from the folks at Moss Bros when I visit to collect my Cardies. Some people even wave from other cars. David . July 28, 2009 . Have you ever driven a V70 T5? Stunning car to drive, and surprisingly rapid for a car of its size. It just gets the job done without shouting about it.